The Whistle Stop is a contemporary beautifully presented, detached holiday home that makes an ideal retreat. Recently converted from an architect’s studio to a bright and spacious property within the walled gardens of the owners’ home built in c1870, (The Grey House, Cagefoot Lane). Located in the pretty village of Henfield, West Sussex, a 2 minute walk to the nearest pub, cafes and local shops. The Whistle Stop is tastefully and stylishly furnished throughout, offering free wi-fi and a starter welcome pack, including a bottle of wine. Log stove for winter nights. Free parking and well established walled garden, patio and terrace for guests use. Secure cycle storage available by prior arrangement. The Whistle Stop makes the ideal setting for short breaks for a relaxing long weekend, being ideally positioned for exploring the local countryside, South Downs National Park, Goodwood Festival of Speed, Brighton Festival and visiting the historical town of Horsham. Places to visit include: Alfriston, Borde Hill Gardens, Chartwell, Charleston, Devil's Dyke, Firle Place, Leonardslee Gardens, Nyman Gardens, Monk's House, Parham House, Pashley Manor, Petworth House, Polesden Lacey, Sheffield Park Gardens, Standen House and Gardens, Wakehurst Place, Wisley. Jo and Gavin have an Architects and Interior Design practice here in Henfield for over 20 years and lived at the property since 2001 restoring and extending the house and creating a charming garden. All works are currently overseen and regularly inspected by 'Macy' the Jack Russell. South facing with fully glazed doors to terrace, two sofas (one sofa bed). The Whistle Stop is fitted to a high standard with a 42” flat screen SMART TV with Freeview. Blu-ray/DVD player, high speed Ethernet access and wifi. The dining area is furnished with a solid oak table and four brown leather chairs. There is a fully equipped kitchen with multifunction oven, induction hob, extractor fan, microwave, slow cooker, fridge, washing machine, heated clothes airer and dishwasher Spacious contemporary Hansgrohe large walk-in tiled shower with raindance shower head. Hansgrohe ‘push button’ shower value for easy use. The bedroom is luxuriously furnished with a Super King sized bed, this can be used as two 3’ beds if required, luxury cotton sheets, wardrobe, bedside cabinets and lights, tall boy chest of drawers and dressing table with mirror. 26” wall mounted flat screen TV with Freeview. All bed linen, towels and toiletries are provided with weekly change. Designated parking for one car immediately outside the property. There is a number combination lock which I will text/email you before you come so you can gain access to suit yourselves. 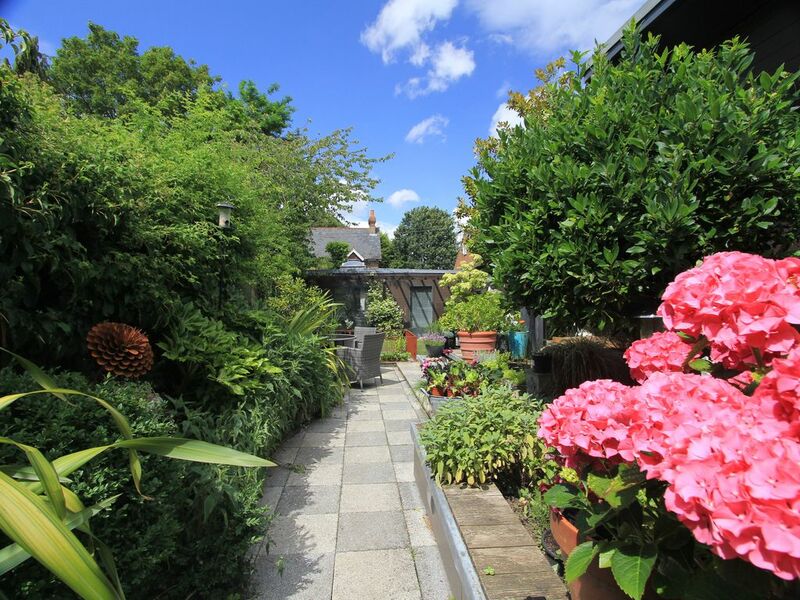 A secluded shared walled garden with own patio/table and chairs which guests may use. South facing with fully glazed doors to terrace, two sofas (one is a sofa bed), seats 4. 42" flat screen SMART TV with Freeview. Condiments, olive oil, vinegar, pasta, rice, starter pack tea, coffee, milk, sugar, bread, jam, butter, eggs. Numerous serving dishes, white crockery, stainless steel cutlery, microwave dishes, chef knives, wine glasses, glass tumblers, egg cups. Ideally located. Spotlessly clean. Made to feel very welcome. We enjoyed five very enjoyable days and nights in the studio. From our first contact with Jo, through the check in process and then finding the studio to be even better than we had hoped made for a great break away. A cosy but modern place which is nice to relax in if you need to chill. Also a great base for exploring. Went for a jog on the downslink nearby. Also wandered round the village with interesting alleys and a shops. Friendly and decent hosts, would recommend. Lovely having our own lounge and kitchen to come back to after a hard day sightseeing. Everything you need is included. Lovely place, lovely people, lovely doggies... Stay if you can! Jo had been very helpful, the flat was very clean. Very nice, clean and well equipped space; I went there for a songwriting retreat and it was perfect. Nicely tucked away and quiet enough, but also within walking distance to some useful amenities, and a great nature reserve less than a 5 minute drive away which is well worth a visit. Great knowing that Jo and her husband are staying opposite too, I knew that if I had any issues (which I didn't) they would be there in a heartbeat to help. I will definitely be coming back at some point!